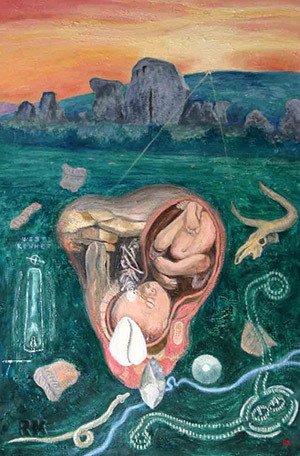 Cycle of eight oil paintings by Ric Kemp illustrating the possible eight stations of the megalithic year at Avebury Stone Circle in Wiltshire, England. The shortest day of the year and possibly the most important calendar date for these New Stone Age people, so completely at the mercy of the seasons. The newly risen sun can be seen breaking over the midwinter horizon glimpsed through the colossal silhouetted form of Circle Stone 98 which faces away to the sunrise at this time of year. 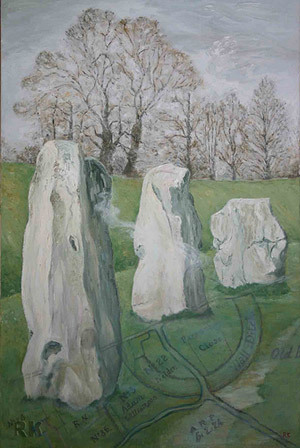 An antique plan of Avebury (called here ‘Abury’) can be seen superimposed on the painting, the plan illustrating the henge’s cardinal layout. Originally, the winter solstice would have been marked at Avebury with a huge dawn shadow cast by a central monolith known as the Obelisk, which stood in the middle of the South Inner Circle. The shadow would have been received by (now also missing) South Circle Stone 112. The Obelisk ‘fell down’ in the 1720’s but some suspect it was intentionally felled, since many Avebury Stones were being sadly destroyed at this time. Old Celtic name for a festival called ‘Candlemas’, a form of early agrarian spring time, when ewes first lactate. The three megaliths featured are Circle Stones 31, 32 and 33. 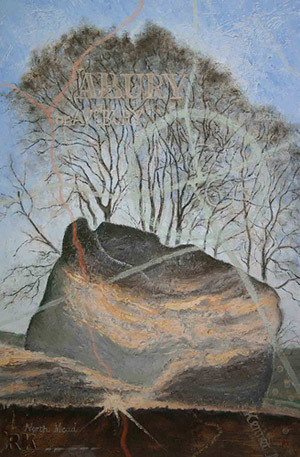 Stone 33 also features in the Summer Solstice painting as a ‘goddess stone’ but seen from a different angle. Silvery waters from the Swallowhead Springs can be seen imaginatively entering the circle of Avebury in the middle of the composition. The map in the lower half of the painting is from the Inclosure map of 1794. An approximate plan of the Kennet River at Avebury – its intersection with the Beckhampton Avenue - can be seen in the Samhain composition, with the position of the Swallowhead Springs as an exaggerated curve in the watercourse. Beyond the three featured Stones is the edge of the circle giving way to the ditch and berm. The ditch at Avebury was originally a massive 9 metres in depth and the white chalk of the berm – just like Silbury Hill - would have been completely dazzling to the onlooker. 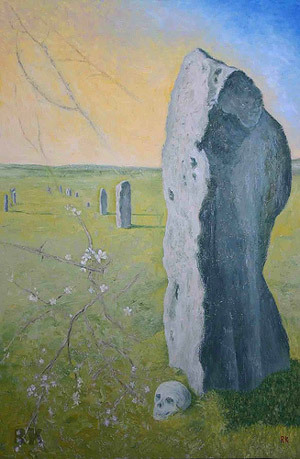 This painting looks south down the West Kennet Avenue with Stone 24B in the foreground. A skull points east – many Bronze Age burials were oriented eastward, perhaps symbolising rebirth with the rising sun? Several avenue stones were found to have human burials at their feet including Stone 25B immediately beyond the nearest megalith. The spring sun of the Vernal Equinox is rising over the Ridgeway ancient track, out of the picture frame but visible from the megalithic rows, casting long morning shadows from the avenue stones. Spring was likely to have been a particularly critical time of year for early farming communities, with last years food resources exhausted and Natures larder yet bare. Early sloe or blackthorn can be seen blooming as it does locally. The avenue once almost certainly stretched over several kilometres from Avebury through West Kennet to where it eventually climbed Overton Hill to end at a small stone circle, today known as the Sanctuary. Celtic name for festival marking early summer and this period of the year which extended to Samhain (October-November). The historic Celts are not archaeologically represented at Avebury but their immediate forebears from the Bronze Age are, to wit the ‘Celtic torc’ from the Lughnasa (August) composition. 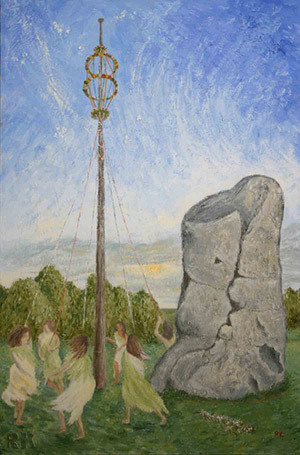 The painting shows a maypole near to where the vanished Obelisk used to stand, and there is evidence to suggest some of the Avebury villagers erected a maypole at this site in the eighteenth century, perhaps continuing an Obelisk tradition stretching back millennia? Researching this composition I noticed what appeared to be an embracing couple in profile on Stone 106 from the South Inner Circle. This would seem to be apt since 106 is the stone that the now absent Obelisk would have ritually pointed out with its long shadow on May morning. A hastily discarded blossoming sprig of May (hawthorn) can be seen at lower right of the composition as the celebrants rush to join the dance. Composition records the North Cove arrangement of massive standing stones at Avebury, which face the dawn horizon on Midsummer Day. It is believed a ‘sighting stone’, Stone “F” once cast its shadow inside the cove, aligned with the summer solstice sunrise over Hackpen Hill about two kilometres east of Avebury. The antlers symbolise the thousands of antler picks which were used to excavate the vast ditch and berm around the stone circle, and carefully deposited on the floor of the ditch at the completion of the project; perhaps also an intentional symbolic hoop of antlers around the stone circle. The wild flowers are poppy – abundant locally - and St John’s wort, a golden yellow flower traditionally associated with midsummer. The featured megalith - suggested by Terence Meaden - is Stone 32 [lower left], which some have seen as a ‘female stone’ – perhaps a goddess - on account of its shape. 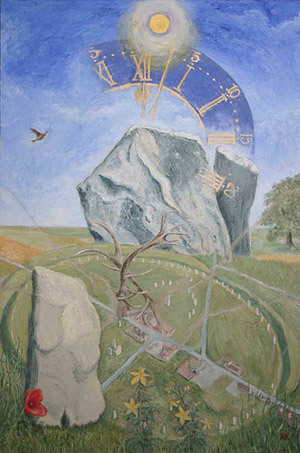 The clock face was inspired by the time piece on the Alexander Keiller Museum at Avebury. The Celtic name for Lammas, time of the ‘first fruits’ of harvest. Lugh (Lleu) is an ancient god associated with the time of harvest, horse and livestock fairs, often held on hilltops. 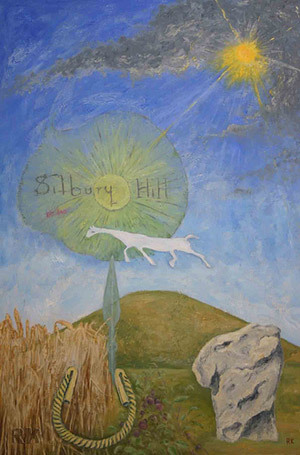 The painting suggests the sudden summer storms which sometimes occur at this time of year, with the sun mirrored in the round shape of Silbury Hill – part of the Avebury Complex. The gold torc and Bronze Age spearhead were both recovered from the local downs in 1844 by a man digging for flints. Featured are mature corn and sloe berries which ripen through August. A livestock fair was held on Tan Hill at this time of the year for centuries - close to where the torc was found - and may even date back to the Neolithic period. The chalk hill figure is the nearby white horse from Alton Barnes which seems to be echoed in the ‘horse head’ shape of West Kennet Avenue Stone 37B (lower right). The horse heads, of which there are several at Avebury may also be deer or doe; a quantity of carefully deposited deer antler was recovered from Silbury Hill during excavation. The painting symbolises the equal hours of day and night before night gains the upper hand and the days become shorter, hence the moon above the sun. Wiltshire corn figurines indicate the end of harvest when these were traditionally woven from the last stands of corn. As the last of the corn, this material seems to have been believed to contain the ‘spirit of the corn’ and carefully preserved from harvest to harvest. Local toadstools herald autumn and late dandelions are going to seed while a phantom megalithic avenue extends into twilight on the horizon. The nearest traditional name for the autumn equinox is Michaelmas. ‘Mabon’ as a feast day name appears to be entirely modern. Alexander Thom has proposed a sixteen month calendar for the Neolithic period in Europe, but by the time of the historical Iron Age the solar year was largely perceived as summer and winter marked by major festivals at Beltane and Samhain. Celtic name for Hallowe’en ('evening of the saints'), in fact an Iron Age survival of the end of the pagan Celtic summer festival, the historical Celts marking May Day and Samhain as the major points in the seasonal year. 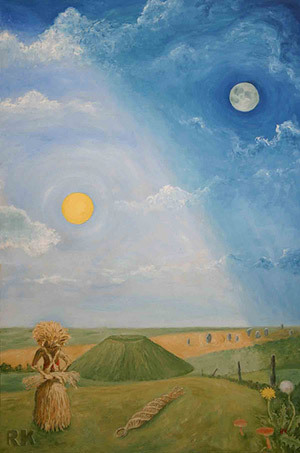 The megalithic structure is West Kennet Long Barrow burial chamber, from which Silbury Hill can easily be seen. The overview of Avebury is based on the antiquarian William Stukeley’s design circa 1724, and shows the full double avenue feature he suggested. The bovine skull is aurochs, ancestor of the cattle which the Neolithic farmers at Avebury were steadily domesticating. The blue watercourse is the Kennet River shown crossing the Beckhampton Avenue which intersection was probably heavy with symbolic meaning for the Avebury People. The avenues seem to echo the serpentine water course which wends its way past Silbury Hill, here in dazzling white chalk and seen from above. An almond-shaped flint ‘leaf arrowhead’ stands before the burial chamber and a symbolic cowrie shell is shown similar to cowrie remains recovered from the barrow.